Depression glass collectors are often introduced to Texas Centennial collectibles through "swanky swigs." These colorfully decorated tumblers are usually the size of a juice glass. They were produced in a number of styles in 1936 decorated with a horse and rider decal on one side and the Texas Centennial logo on the reverse. They were made in clear glass with decals in differing colors, like those shown here, and in cobalt blue with white decals. Once the introduction to the World's Fair known as the Texas Centennial has been made, collectors discover that many, many items were sold to commemorate this event. They are collected today by both World's Fair enthusiasts and those will a penchant for Texas history. This exposition, held during the height of the Great Depression, took place in Dallas, Texas from June 6 through November 29, 1936. It was not considered to be a huge success in comparison to other expositions and fairs held during that era. Even still, many Texans made their way to Dallas for the event and most all of them brought home some type of souvenir. 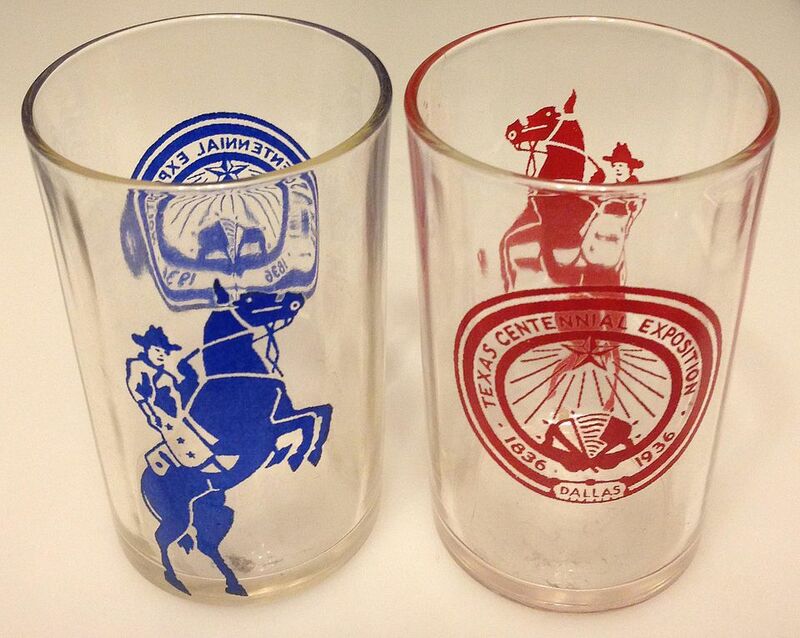 Little information has been produced for collectors pertaining to Texas Centennial souvenirs, but there are quite a few advanced collectors of Centennial memorabilia floating around the collecting universe. Some of them have some pretty impressive collections that include fairly obscure items such as paper drinking cups that were for the most part discarded during the event, along with other rare ephemera. The exposition's official logo, a round Texas Centennial Exposition 1836-1936 seal, decorates many of the souvenir items collectors seek today. It is most easily recognized when accompanied by a colorful representation of "Texas Under Six Flags." This particular seal and flag logo were used on many different items including plates, water jugs, and even bands bedecking straw cowboy hats. Generally, the glass and ceramic pieces held up well over the years so those items beckon collectors most frequently in antique malls and shops, and they turn up in online auctions fairly often as well. This logo was also affixed to many delphite, a type of opaque light blue glass characteristic of the Depression era, cowboy hat paperweights in the form of a paper sticker. After years of cleaning and wear, most of these labels have worn off leaving a nice Depression glass collectible many people haven't yet associated with the Texas Centennial. Other items were produced with an outline of the Alamo raised in the glass and many different commemorative plates can be found, including a beautiful blue and white glazed version produced by Wedgwood. Paper items were also brought back from the exposition, but many of them have started to deteriorate with age. This is especially true of those that weren't stored away from light, wood and other paper products that emit harmful acids. One of the most informative Texas Centennial items collectors can utilize to learn more about the event is an official souvenir guide that sold for 25 cents at the exhibition. Filled with drawings of the various exposition buildings and halls, such as The Electrical Hall, The Dallas Aquarium, and The Hall of Communications, most of them display the Art Deco styling so popular during the 1920s and '30s. Some of these buildings are still standing in Dallas Fair Park today. "In the A. Harris & Company exhibit, you will find, in a tasteful setting, the presentation of one of the major department stores of Dallas. The space of this company is devoted to the display and sale of many interesting Centennial souvenirs and articles which are typical of Texas, Mexico, and the Southwest." Other interesting exhibits in the same building included a huge Coca-Cola display with a working bottling facility used to stock the vending stations at the exhibition. There was even a Czechoslovakian exhibit where "many articles of merchandise brought from that colorful land" including "gay peasant costumes, porcelain, glassware, hand-painted woodenware, leather goods and other items are offered for sale." Visitors will also find a Texas Centennial exhibit in the Bob Bullock Texas State History Museum in Austin, Texas. In addition to a small rotating exhibit of collectibles relating to the event, there is a short movie providing insight into what the exposition offered attendees.